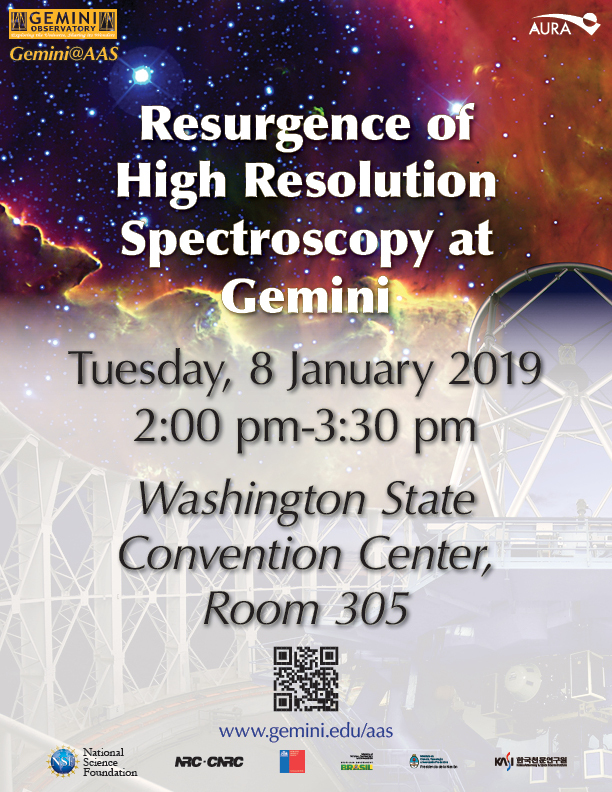 Visit the Gemini Observatory Booth in the Exhibit hall! 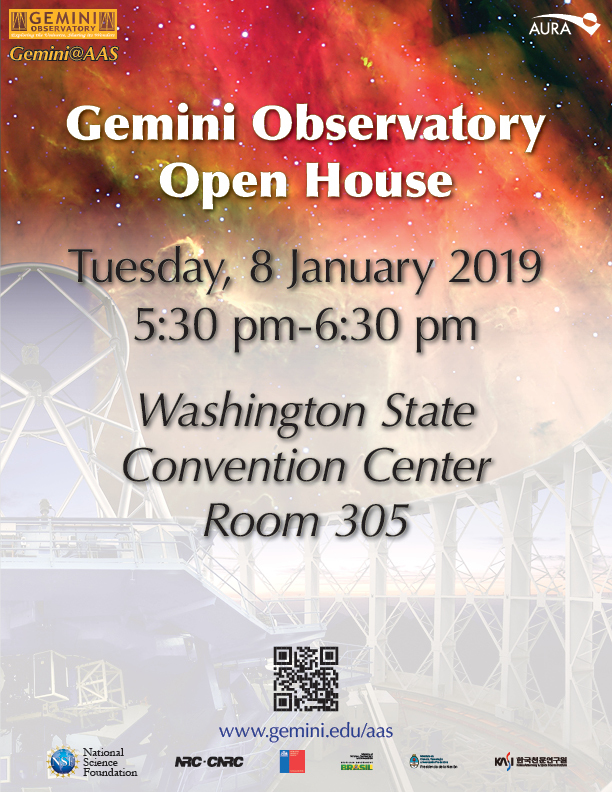 Visit the Gemini Observatory Booth in the Exhibit Hall at any time! Get your own deck of the Gemini Card Game! Since 2017, the NSF’s Mid-Scale Innovations Program has made the resources of Las Cumbres Observatory (LCO) available to the US astronomical community. The goals of LCO’s program are two-fold: to allow US astronomers to gain experience coordinating follow-up observing programs and to promote the building of infrastructure (software, communication protocols) that are needed to maximize the return from time-domain surveys. LCO, with its global network of telescopes dedicated to follow-up observations of time-variable phenomena, is an excellent vehicle for achieving these goals. Present surveys (e.g. ASAS-SN, ZTF, TESS) already provide a wealth of targets for follow-up observations. The flood of data will rise when the LSST begins surveying the sky in 2022. 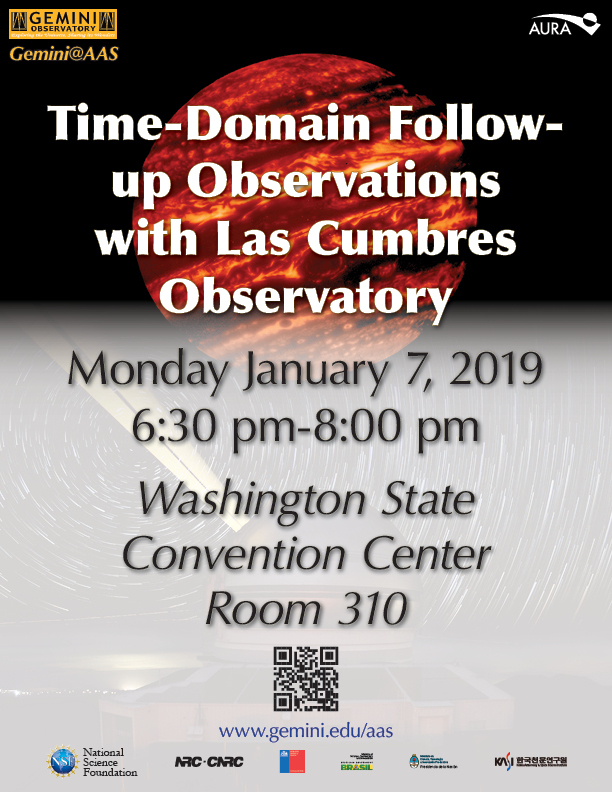 The impact of these surveys will be diminished if discoveries are not promptly supported with complementary observations from other facilities.This splinter meeting will present science highlights from the first two years of the NSF/LCO “Open Access” program. The meeting is an opportunity for current and potential LCO users to connect with LCO scientists. We will present an overview of the LCO network with an emphasis on recent improvements and imminent developments. Members of LCO’s key project teams will discuss how they interact with the network and describe the software tools that they have developed to manage their programs. We will report on our effort to provide the time-domain astronomy community with a standard “toolkit” for creating Target & Observation Management (TOM) software. Finally, we will describe a joint initiative between LCO, SOAR, Gemini and NOAO to build a coordinated network of facilities, called AEON, optimized for time-domain astronomy. Verne Smith (NOAO): Overview of science results from the high-resolution spectrographs offered at Gemini. Jeff Carlin (LSST): Science from the optical spectrograph GRACES (Gemini Remote Access to CFHT ESPaDOnS Spectrograph). Hwihyun Kim (Gemini): Science with the 1.5-2.5 micron near-infrared spectrograph IGRINS (Immersion Grating Infrared Spectrometer), a visitor instrument that was recently scheduled at Gemini South. Jacob Bean (University of Chicago): Overview of the high-precision radial velocity spectrograph MAROON-X, which should be available at Gemini North in 2019. Steve Margheim (Gemini): Status and overview of the future Gemini facility optical spectrograph GHOST (Gemini High Resolution Optical SpecTrograph). In the past decade, advances in adaptive optics instrumentation have led to a rapid increase in the number of high-contrast imaging systems on large, ground-based telescopes. These systems have generated exciting new discoveries about extrasolar gas giant planets and circumstellar disks. In the 2020s, the lessons learned from these instruments will allow for technological advances that will open up a new suite of scientific possibilities. These possibilities include not only access to new populations of exoplanets, but also to other high contrast regimes such as probing the inner regions of local AGN hosts. 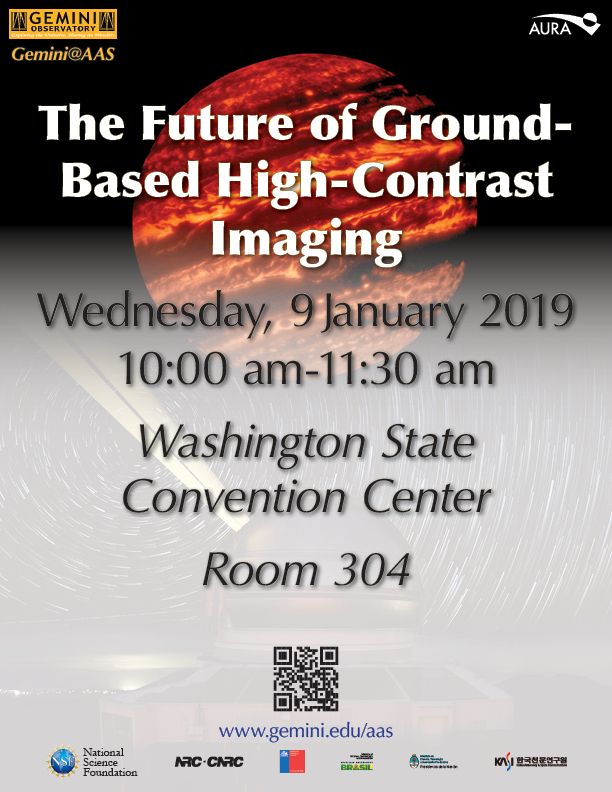 This splinter meeting will offer a series of presentations on potential science cases for the next generation of high-contrast imaging systems, including upgraded instruments for 8-10 meter class facilities and plans for the future 20-30 meter class telescopes. Time will be reserved for discussion of additional science opportunities with these instruments. Broad participation from the community is welcome and encouraged. SCORPIO is envisioned as a workhorse instrument for the Gemini Observatory, capable of wide-band medium-resolution spectroscopy and multi-band imaging covering a broad spectral range, combined with high time resolution. These capabilities are very well suited for efficiently characterizing a large variety of transient and static sources detected by large-scale surveys, in particular by the Large Synoptic Survey Telescope (LSST). Spectral coverage from the optical to the near-infrared, in imaging and spectroscopy, is crucial for a wide range of science, from primitive solar system bodies, to stellar explosions, to accreting compact objects, to high-redshift sources. The high time resolution allows for studying fast changing phenomena, something that has been largely unexplored at Gemini sensitivities. 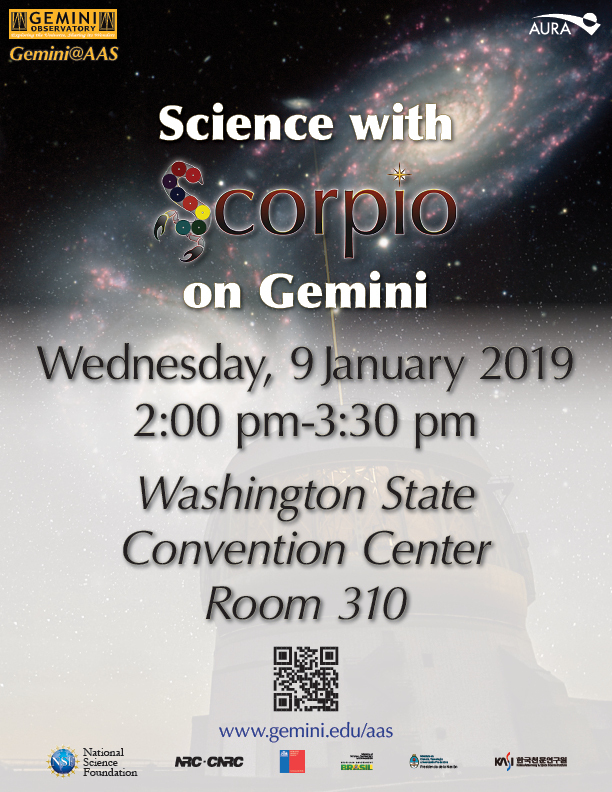 In this Splinter Meeting we will give a status report of the instrument, which is currently in the Critical Design Stage; give an overview of the main science drivers of the instrument; and discuss the broad range of scientific applications of SCORPIO. Your contribution presents Gemini related work and it is not listed here? Please send details to sus_inquiries@gemini.edu.